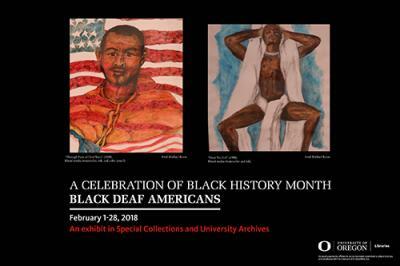 The Special Collections and University Archives (SCUA) has recently mounted an exhibit focusing on Black Deaf Americans to celebrate Black History Month. Black Deaf people have one of the most unique cultures in the world. The Black Deaf Community is largely shaped by two cultures and communities: Deaf and African-American. Some Black Deaf individuals view themselves as members of both communities. Since both communities are viewed by the larger, predominately hearing and White society as comprising a minority community, Black Deaf persons often experience an even greater loss of recognition, racial discrimination and communication barriers coming from both communities. Despite these challenges, Black Deaf Americans have made great strides in American Society and maintain a high level of pride in their accomplishments. Little has been written about the Black Deaf community. Even though segregated schools existed until the mid-1950s, no historical analysis of that experience, its people, or events has been written. Only a handful of memoirs by Black Deaf individuals have been published. Recent interest in Black Deaf sign language has produced a seminal work on the subject but much more research needs to be pursued. The materials on exhibit cover six themes: segregated schools for Black Deaf students, memoirs by Black Deaf adults, incarceration of Black Deaf, Black Deaf sign language, Notable Black Deaf, and artwork of Black Deaf. Some of the archival material exhibited is extremely rare and difficult to find. Several publications on exhibit are considered rare books. Even some recent titles on exhibit are difficult to find. We hope you will take time to see this unique exhibit focusing on one of America’s most unique but underrepresented cultures. This event is free and open to the public. Accommodations for people with disabilities will be provided if requested in advance by calling 541-346-3056, or email libadmin@uoregon.edu.